On May 10, 1998, teenaged amateur astronomer Leo Biederman discovers an unusual object near the stars Mizar and Alcor at a star party. His teacher has Leo take a picture and then sends it to astronomer Dr. Marcus Wolf. Wolf realizes that the object is a comet on a collision course with Earth. Unfortunately, Wolf dies in a car accident on his way to try to alert the authorities. One year later, MSNBC journalist Jenny Lerner investigates the sudden resignation of Secretary of the Treasury Alan Rittenhouse and his connection to "Ellie", supposedly a mistress. After interviewing Rittenhouse, she is taken by the FBI to see President Tom Beck. After this, she finds out that Ellie is really an acronym: "E.L.E." ("extinction-level event"). Due to Lerner's investigation, President Beck makes an announcement earlier than planned: the comet, that has been named Wolf-Biederman, is headed for Earth and it is 7 miles (11 km) long, large enough to cause a mass extinction, and possibly wipe out humanity. He also reveals that the United States and Russia have been constructing an Orion spacecraft called the Messiah in orbit that will transport a team, led by Mission Commander Oren Monash and including veteran astronaut Captain Spurgeon "Fish" Tanner, to the comet, hoping to alter its path with nuclear weapons. 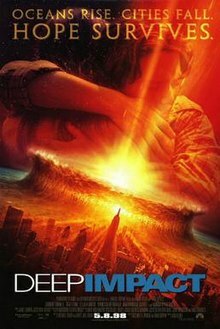 After landing on the comet, the crew plant nuclear bombs beneath the surface, but are caught in outgassing explosions when sunlight heats up the comet. Monash is permanently blinded by unfiltered sunlight and suffers severe facial burns, while Dr. Gus Partenza is flung into space by an outflow of gas. When the bombs detonate, the ship is damaged by the blast and the team loses contact with Earth. President Beck announces that the bombs only split the comet into two smaller pieces, nicknamed "Biederman" (1.5 miles (2.4 km) long) and "Wolf" (6 miles (9.7 km) long), both still heading for Earth. Beck then imposes martial law and reveals that governments worldwide have been building underground shelters. The United States' shelter is in the limestone caves of Missouri. A lottery selects 800,000 Americans under age 50 to join 200,000 selected individuals, as well as a massive supply of food, genetically viable populations of significant animals, and the seeds of every plant species. Lerner and the Biederman family are chosen, but Leo's girlfriend Sarah Hotchner and her family are not. Leo marries Sarah to try to save her family, but it does not work. Sarah refuses to leave without her parents. Meanwhile, Lerner gives up her seat in the last evacuation helicopter to her friend Beth and Beth's young daughter. She joins her estranged father Jason at their family beach house, where they reconcile. Biederman hits the water, creating a megatsunami that destroys the Eastern Seaboard of the United States. Lerner, Jason, and Sarah's parents are among the thousands that are killed by the massive wave. Leo, Sarah, and her baby brother are able to reach the higher grounds of the Appalachian Mountains safely. Unable to safely attempt a second landing, the crew of Messiah decide to obliterate Wolf by undertaking a suicide mission. After they say goodbye to their loved ones by video conference, they fly directly into a large deep crevasse created by out-gassing, and use their remaining nuclear warheads to blow Wolf into smaller pieces that burn up harmlessly in Earth's atmosphere. After the waters recede, President Beck speaks to a large crowd at the US Capitol which is being rebuilt, encouraging them to remember and honor the heroes for their sacrifice.